Now that is spring, soon all the daffodils will be popping up. In fact, mine have been trying to pop up for a couple days now. 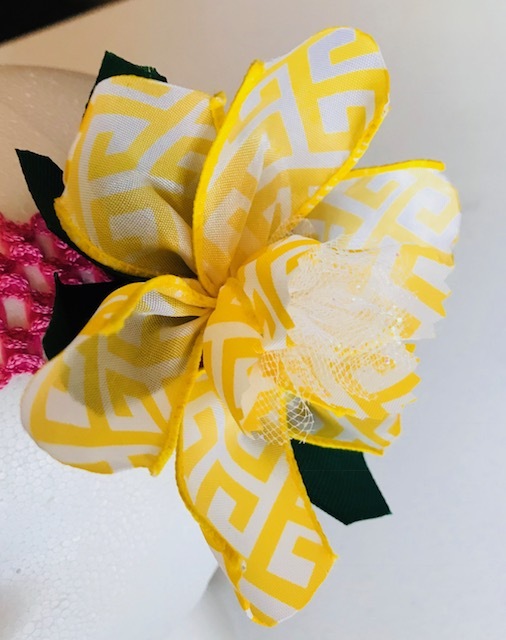 So to liven up your moods this Easter in lieu of an Easter bonnet why not wear a cheerful spring daffodil headband instead? This little daffodil flower is super easy to make and the spring daffodil headband would look great on a baby as well. 1. Gather all your supplies. 2. Prepare all your ribbon pieces. 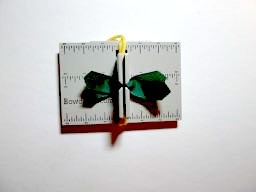 Cut three pieces of green grosgrain ribbon 5 inches long. Fold and cut in the opposite way you make a dovetail to make a point on each end. Set aside. Seal the ends with a lighter or clear nail polish. 3. 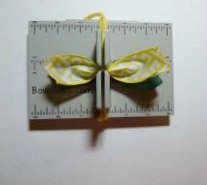 Next, cut three pieces of yellow wired ribbon 5 ½” long. Using scissors cut around each end to make a curved shape. Brush the ends with some clear nail polish to seal. Set aside. 4. 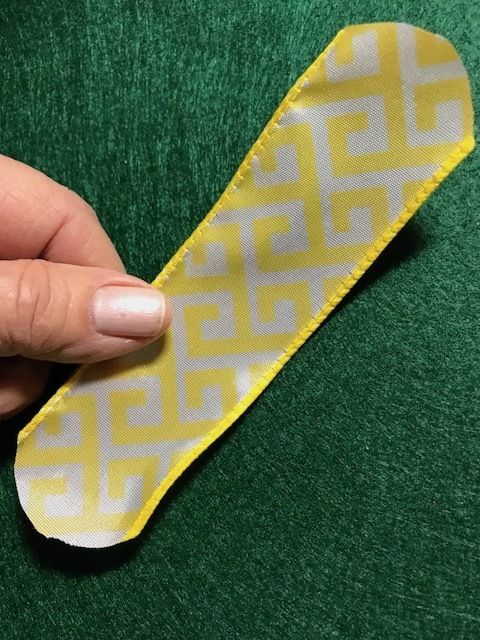 Now, cut 2 more pieces of the 1 ½”yellow wired ribbon 3 inches long. Curve the ends with pinking shears. Use clear nail polish to seal the ends. 5. 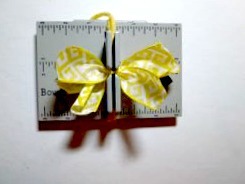 Cut a piece of sparkle tulle 1 ½” wide x 8 inches long. 6. 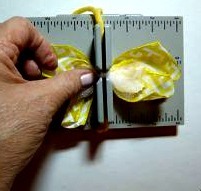 Cut a piece of yellow yarn, fold in half and insert into the Mini Bowdabra. You will have a loop on one side and two loose ends on the other, which will be your slipknot. Tuck the ends under to keep out of the way while you make your daffodil. 7. 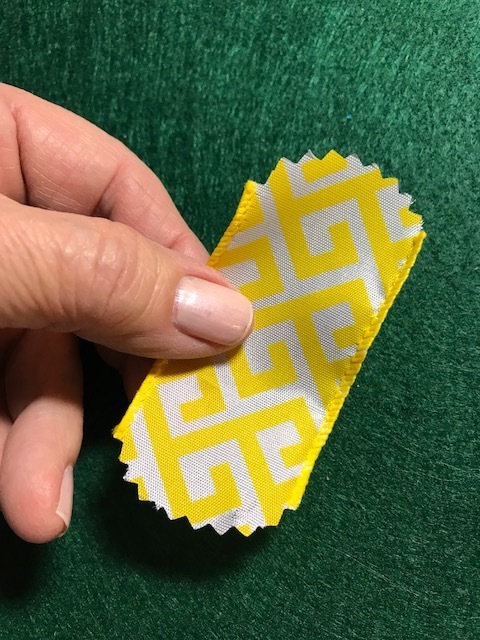 Now, insert the green grosgrain ribbon pieces, pinching to a mountain up fold as you insert them. 8. 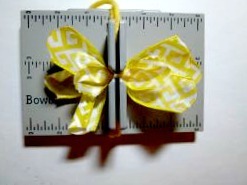 Then insert the longer pieces of yellow ribbon into the Mini Bowdabra. 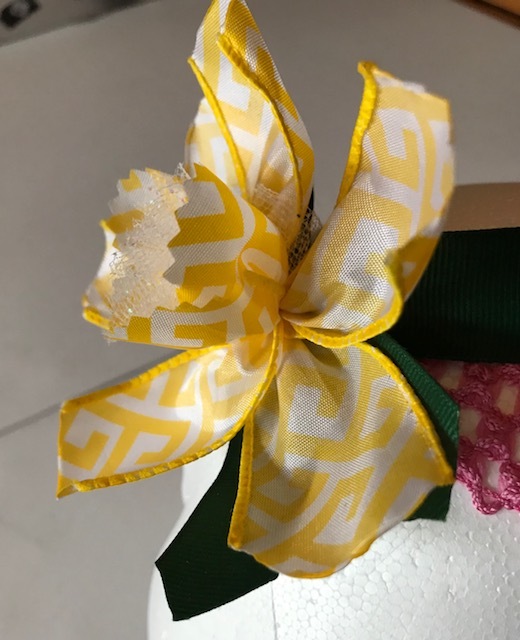 Next, insert the smaller pinked edged pieces of yellow ribbon into the Mini Bowdabra. 9. Finally, insert the tulle from the top like an accordion. Scrunch down with the Bowdabra wand. 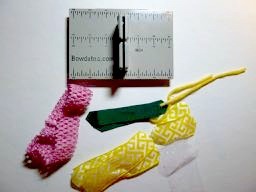 Insert the two loose pieces of yarn through the loop and pull tight while the daffodil is still in the Bowdabra. 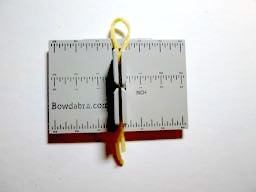 Remove from the Bowdabra, separate the ends, turn to the back and tie a knot. 10. 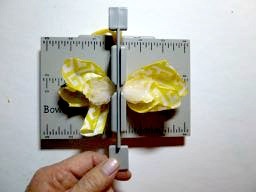 Now shape your daffodil. Fan out the petals and cut the center around the tulle. Since the petals are wired it is very easy to shape. 11. 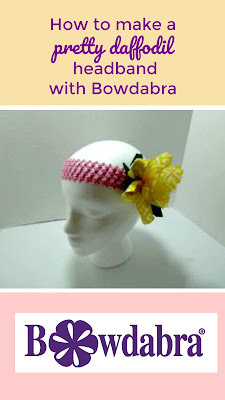 Use the excess yarn to tie to a headband. 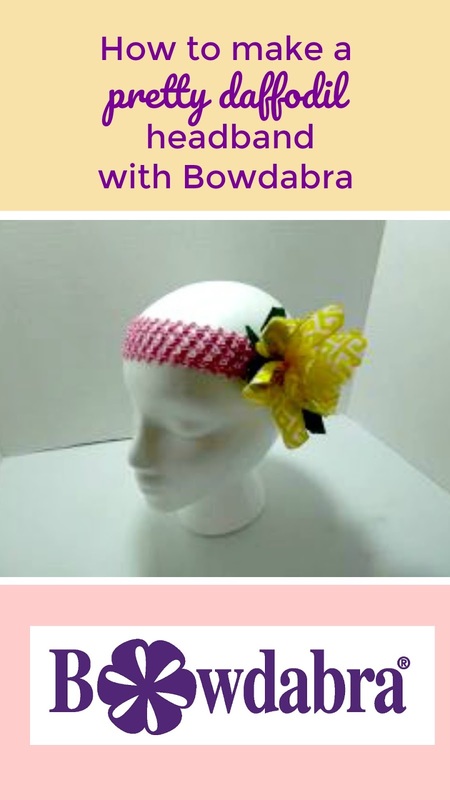 If this is for an infant the yarn is gentle on the babies head.